Mt. 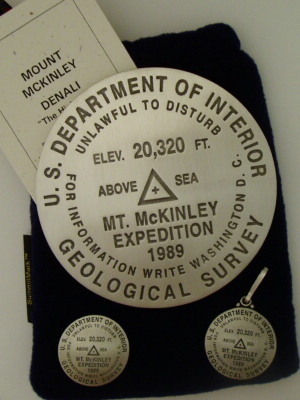 McKinley Paperweight This 3 ¼” diameter paperweight is made of cast pewter and features a replica of the U.S Geological Survey marker located at the summit of Alaska's Mt. McKinley (20,320 ft., aka Denali), the highest peak in North America. Comes in fleece stuff sack with braided cord and cord lock, along with tag containing information on the mountain.